I never thought I would need a FitBark Dog Activity Monitor, and now I’m so glad I have one. At the beginning of August, I shared 5 Tips To Keep Your Pet Fit This Summer after I attended a Google Hangout with Dr. Kurt Venator, (Purina Veterinarian). 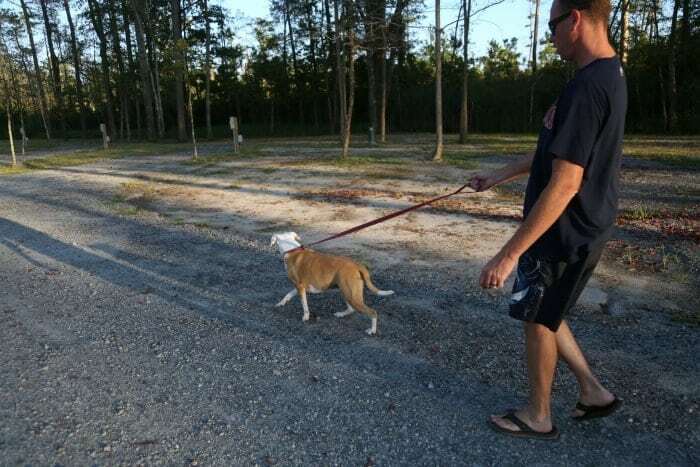 I learned a so much and I explained in my last post that I knew my dog wasn’t getting enough exercise, but I had no idea just how much my family was going to need the information I had just learned or how much I would appreciate our new FitBark. Two weeks after writing the first post, Sophie had a vet appointment for an ear infection. My husband texted me during the appointment and told me something I never expected to hear from our vet. The vet informed us that our dog is overweight. At first, I thought my husband was joking because I honestly just can’t see it. Maybe I just don’t want to believe it, but that day when Sophie came home, we sat the kids down and explained to them that they could no longer sneak Sophie treats under the table. We made sure that they understood just how serious this is and after seeing their response we know they understand. My oldest will go as far as sending her outside during dinner, so she doesn’t beg under the table. I never realized how much the kids were feeding her, and if I’m honest, I probably gave her a lot more than I should have. The first week was the hardest for everyone, especially Sophie. She struggled and would go as far as licking the crack of the fridge trying the find any food that may have been dropped, but she’s finally realized that dog food is the only food she’s getting now. Food is only one part of Sophie’s problem. Now we have to get her active. We are a very active family, and Sophie goes everywhere we go, but we’ve never actually trained her, so it makes it hard to take her anywhere. She pulls on the leash when we walk her, and she tries to go after other dogs so now we have to work to train her because she needs to be able to go out with us when we go for walks and even when we go out on the water. On our last camping trip, we made it our goal to spend more time working with Sophie, and we saw some pretty fabulous results. Every walk was easier than the one before and the water play was a lot of fun! She is getting better at listening to us and letting us walk her, and it’s not as hard on our backs (or the leash). She has broken five or six leashes and broke on on this camping trip, but her health is worth it, and this is partly our fault because we should have trained her when she was a puppy, but we didn’t so now it’s a little harder. The impressive thing about our FitBark is that it does what I can’t. Obviously, I know when I take Sophie for a walk or if we let her go out on the water, but we don’t always know how active she is when we let her go out or when the kids play with her outside. Now I can keep track of her total daily activity and add in additional play time based on what the data I see tracked on my phone. That’s pretty impressive. Having the FitBark helps us because we can set goals for Sophie and it reminds us to get out with her and help her reach those activity goals. There are three goal levels with FitBark. Sleep, we all know how important sleep is, but how can we track a dog’s sleep? Well, before FitBark I’ve never been able to track it! According to our readings, Sophie’s sleep is in the 95% percentile, so that seems pretty good. She is a snorer, so I was curious to see if that meant anything. I have always wondered if she is experiencing nightmares or dreams because of her whimpering but I it looks like she is sleeping well, so that is great. I can’t wait to see how it reads after a thunderstorm because I fully expect it to read very low. After that, I will know it reads accurately. I feel blessed that I was chosen to participate in the Google Hangout with Dr. Kurt Venator because at the time I had no idea how useful the information would be and now I feel like Sophie’s life will fuller and possibly longer because of it. So I would like to say a special thank you to the people at Purina for caring so much about our pets and doing all you can to educate us on ways to keep them both happy and healthy! If you are interested in tracking your pets activity, you should check out FitBark for yourself you can purchase yours here. I wished I had this when my dog was alive as he was always barking. This would have been something I would have liked to try out on my Sammie. This is such a great product! I have never thought about having one on a pet! That's a neat little gizmo! I have an indoor Pomeranian. I bet I would be shocked at how low her activity level is. This article really made me start thinking. Thank you so much for taking the time to share it with us all! These dog monitors are becoming really popular. All dog should have this. I think this is a great platform to monitor your dog's activity. wow, there are even monitors for the pets, love that. This is great for those who want to be better in sync with their pets. My dogs need this. This is great. I had a crazy dog who could have used this. I think this would also help pet owners to be more aware of their own activity levels as well. Thank you for all the great information you provide! This is a really neat thing. I have a dog that we have been trying to get to lose weight for awhile. We have tried cutting back his food and getting him more exercise. This can make the whole family responsible and see his progress. Nifty idea to really track your dog's progress. I know someone who needs one! I'm not sure why others would think it's silly or not useful. We buy people gadgets similar to this. Aren't our dogs health just as important? Thanks for the info. I think it could be helpful for pet owners. I still think this is not really a very useful endeavour. Nice gadget to monitor our little dog who could go fat quick! This is actually pretty cool. Thanks for the info. Happy weekend to everyone! All dog owners need one! It would be interesting to see how much activity my dog gets. Wow! I didn't know this even existed! Thank you so much for the information. This is such a great idea! This would be so super cool for my little Pita! This is a great gadget that will help keep both the owner & dog active. Very cool! What else will they think of! to tell you the truth, I couldn't be bothered! hehe.. not for us. My little doggy is doing just fine. I think my kids would get a kick out of this gadget too if we adopt a pup. It would get them excited about taking the dog out. I'm glad I saw this. We've been looking at adopting & this gives me some peace of mind. Never had a dog before. Great gadget! This is such a cool product! I can see this motivating me as well to get up and stay active! Now that's a cool and helpful gadget - personally I won't need it as I don't have a dog, but I'll definitely share this post with friends who do.